2002 Mitsubishi ML3015HD IIP (S) Dual Table CNC Laser Processing Machine s/n 123HDIIP082 w/ Mitsubishi LC20B Controls, Hand Wheel, 3000 Watt Laser, Mitsubishi ML5036D-S1 CO2 Laser Unit and Processing System, Accuchiller Cooling Unit, 2-Pallet Shuttle System, (2) 60” x 120” Tables, 15,501 Total Hours, 107 Hours Since Last Rebuild March 3, 2016. 2001 Mitsubishi ML3015 HD IIP (S) Dual Table CNC Laser Processing Machine s/n 613HD II P031 w/ Mitsubishi LC20B Controls, Hand Wheel, 3000 Watt Laser, Mitsubishi ML5036D-S2 CO2 Laser Unit and Processing System, Accuchiller Cooling Unit, 2-Pallet Shuttle System, (2) 60” x 120” Tables, 2,094 Total Hours, 798 Hours Since Last Rebuild August 24, 2015. 1998 Mitsubishi ML2512HD CNC Laser Processing Machine s/n 68251HD238 w/ Mitsubishi LC10BV Controls, Hand Wheel, 3000 Watt Laser, Mitsubishi ML5036D-S1 CO2 Laser Unit and Processing System, Accuchiller Cooling Unit, 48” x 96” Table, 19,173 Total Hours, 1,834 Hours Since Last Rebuild December 15, 2015. 1998 Mitsubishi ML2512HD CNC Laser Processing Machine s/n ML1825HD224 w/ Mitsubishi Controls, Hand Wheel, 3000 Watt Laser, Mitsubishi mdl. 4030D CO2 Laser Unit and Processing System, Accuchiller Cooling Unit, 48” x 96” Table, 12,439 Total Hours, 1,093 Hours Since Lase Rebuild July 12, 2014. 1996 Mitsubishi ML3015HD CNC Laser Processing Machine s/n 1630HD111 w/ Mitsubishi LC10BV Controls, Hand Wheel, 3000 Watt Laser, Mitsubishi ML4030D CO2 Laser Unit and Processing System, Accuchiller Cooling Unit, 60” x 120” Table, 17,803 Total Hours, 1,268 Hours Since Last Rebuild October 16, 2015. 1996 Mitsubishi ML3015HD CNC Laser Processing Machine s/n 1630HD110 w/ Mitsubishi LC10BV Controls, Hand Wheel, 3000 Watt Laser, Mitsubishi ML4030D CO2 Laser Unit and Processing System, Accuchiller Cooling Unit, 60” x 120” Table, 15,269 Total Hours, 1,383 Hours Since Last Rebuild July 1, 2015. 1996 Mitsubishi ML3015HD CNC Laser Processing Machine s/n 6530HD098 w/ Mitsubishi Controls, Hand Wheel, 3000 Watt Laser, Mitsubishi ML4030D CO2 Laser Unit and Processing System, Accuchiller Cooling Unit, 60” x 120” Table, 17,964 Total Hours, 1,993 Hours Since Last Rebuild February 11, 2014. 1996 Mitsubishi ML2512HD CNC Laser Processing Machine s/n 6625HD174 w/ Mitsubishi LC10BV Controls, Hand Wheel, 3000 Watt Laser, Mitsubishi ML4030D CO2 Laser Unit and Processing System, Accuchiller Cooling Unit, 48” x 96” Table, 16,820 Total Hours, 1,502 Hours Since Last Rebuild December 8, 2014. 1996 Mitsubishi ML2512HD CNC Laser Processing Machine s/n 1625HD140 w/ Mitsubishi LC10BV Controls, Hand Wheel, 3000 Watt Laser, Mitsubishi ML4030D CO2 Laser Unit and Processing System, Accuchiller Cooling Unit, 48” x 96” Table, 12,040 Total Hours, 1,934 Hours Since Last Rebuild October 3, 2014. 1995 Mazak Super Turbo-X48 Hi-Pro Supercharged CNC Laser Processing Machine s/n 115645 w/ Mazak L32 Controls, 2000 Watt Laser mdl. CO2 LASER YB-L200B 7M6, Travels X=104.3”, Y=50”, Z= 3.9”, 49.2” x 98.4” Table, Orion Cooling Unit, 46,457 Total Hours, Last Rebuilt December 22, 2014. 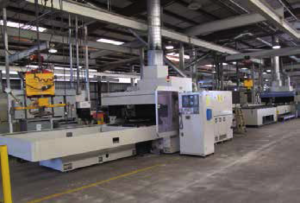 1993 Mazak Super Turbo-X510 Hi-Pro CNC Laser Processing Machine s/n 100812 w/ Mazak L32 Controls, 2000 Watt Laser mdl. CO2 LASER YB2006LB 5M2, Travels X=129.1”, Y=62”, Z=3.8”, 60” x 129” Table, Orion Chilling Unit, 57,190 Total Hours, Last Rebuilt July 1, 2015. 1995 Mazak Super Turbo-X48 Hi-Pro Supercharged CNC Laser Processing Machine s/n 115554 w/ Mazak L32 Controls, 2000 Watt Laser mdl. CO2 LASER YB-L200B 7M6, Travels X=104.3”, Y=50”, Z= 3.9”, 49.2” x 98.4” Table, Orion Cooling Unit, 48,952 Total Hours (NEEDS X-AXIS SERVO AMP $4000 AND Y-Z SERVO AMP $7000). 1995 Mazak Super Turbo-X48 Hi-Pro Supercharged CNC Laser Processing Machine s/n 115564 w/ Mazak L32 Controls, 2000 Watt Laser mdl. CO2 LASER YB-L200B 7M6, Travels X=104.3”, Y=50”, Z= 3.9”, 49.2” x 98.4” Table, Orion Cooling Unit, 46,316 Total Hours (NEEDS Y-Z SERVO AMP $7000). (8) Hakusan Kiko 13” x 42” Motorized Slug Conveyors (FOR MITSUBISHI LASER MACHINES). (6) Tsubakimoto Mayfran mdl. MT10 12” x 48” Slug Conveyors (FOR LASER MACHINES). 1978 Cincinnati mdl. 350CB X 12 350 Ton x 12’ Hydraulic CNC Press Brake s/n 41268 w/ Automec Auto Gauge 1000 CNC Controlled Back Gauging, 14’ Bed Length, 10” Stroke, 10” Throat Depth, 12’6” Between Uprights, Full Set of 8” x 8” Extension Base Plates for Stamping, STI OptoSafe Light Curtain. 1994 Accurpress mdl. 7606 60 Ton x 6’ CNC Hydraulic Press Brake s/n 2448 w/ Accurpress CNC Controls and Gaging System, 6’ Bed Length, 8 1/8” Throat Depth, 54 ¾” Between Uprights, STI OptoSafe Light Curtain. Pexto / Chicago 10’ Pan Brake. Whitney – Jenson 48” Finger Brake. (3) Wales-Strippit 5” x 5” Corner Notchers. (2) Torit mdl. TD-970 Dust Collection Systems w/ Dual Drum Discharge. Torit mdl. TD-650 Dust Collection System w/ Drum Discharge. Quincy mdl. FE390105 15Hp Horizontal Air Compressor w/ 120 Gallon Tank. Hankison mdl. PR50 Refrigerated Air Dryer s/n 0355-9T-9410-1N. 575 Gallon Horizontal Air Storage Tank. (5) Bushman ½ Ton Cap Motorized Floor Mounted Jibs w/ CM Loadstar ½ Ton Electric Hoist, Motorized Rotation. Bushman ½ Ton Cap Motorized Floor Mounted Jib (NO HOIST). ½ Ton Cap Floor Mounted Jib w/ 12’ Span, CM Loadstar ½ Ton Cap Electric Hoist. CM 7 ½ Ton Electric Crane Hoist. (9)CM Loadstar 1 Ton Cap Electric Hoists w/ Trolleys. (4) CMCI mdl. UNIVAC330 2210 Lb Cap Vacuum Sheet Lifts. (2) CMCI mdl. UNIVAC330 1060 Lb Cap Vacuum Sheet Lifts. (4) CMCI mdl. PUP330 1060 Lb Cap Vacuum Sheet Lifts. Acco VAC-U-LIFT mdl. 7600-24-4-4-8-B16N30 Vacuum Sheet Lift. (2) Acco VAC-U-LIFT mdl. 3200 POWER PAK Vacuum Sheet Lifts.